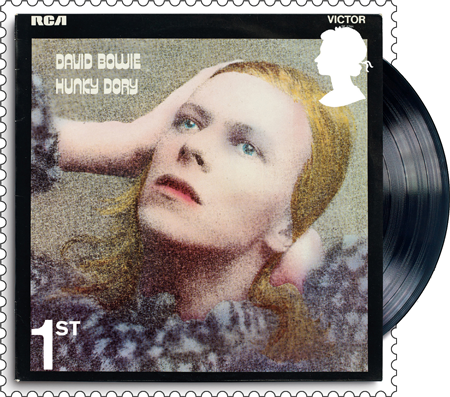 Royal Mail have revealed 10 new David Bowie stamps, which will mark a tribute to one of the most influential music and cultural figures of all time. 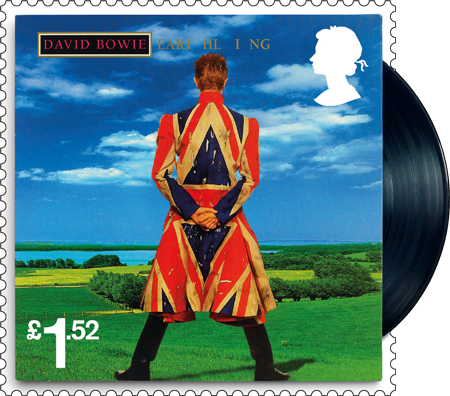 The stamps are Royal Mail’s second dedicated music artist stamp issue, following on from the popular Pink Floyd release in the summer of last year. 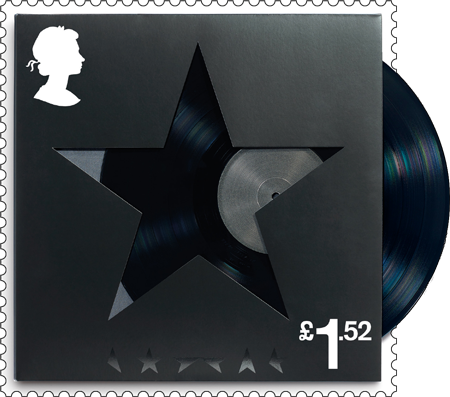 Scheduled for release on 14th March 2017, the stamps will feature iconic album covers and live performances from 1971 right up to his final studio album Blackstar. His fourth album and released in December 1971. Time magazine chose it as part of their “100 best albums of all time” list in January 2010. His sixth album and released in April 1973. The album was among six Bowie entries in Rolling Stone magazine’s 2003 list of the 500 greatest albums of all time. His twelfth studio album and released in October 1977. This was the second instalment of his “Berlin Trilogy” recorded with Brian Eno and Tony Visconti. The title track remains one of Bowie’s best known and acclaimed songs. His fifteenth studio album and released in April 1983. Co-produced by Nile Rodgers, and featured three of the most successful singles “Let’s Dance”, “Modern Love” and “China Girl”. Let’s Dance is Bowie’s bestselling album. His twentieth studio album and released in February 1997, this was the first album Bowie had self-produced since Diamond Dogs. 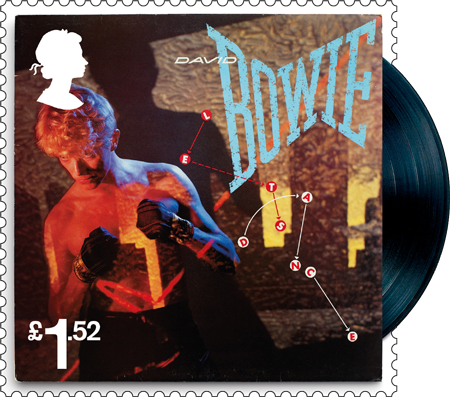 Bowie’s final studio album, released on 8th January 2016 to coincide with his 69th birthday. Bowie died two days after its release. 1st Class – The Ziggy Stardust Tour, 1972: The tour promoted The Rise and Fall of Ziggy Stardust and the Spiders from Mars studio album and took in the UK, North America, and Japan. 1st Class – The Serious Moonlight Tour, 1983: The tour was designed to support the Let’s Dance album and was Bowie’s longest, largest and most successful concert tour. £1.52 – The Stage Tour, 1978: Also known as Isolar II – The 1978 World Tour and The Low/Heroes World Tour because it was staged to promote the Low and Heroes albums. £1.52 – A Reality Tour, 2004: Staged to promote the Reality album this tour was to be Bowie’s last tour. Background Image – The Glass Spider Tour, 1987: launched to promote the album Never Let Me Down. 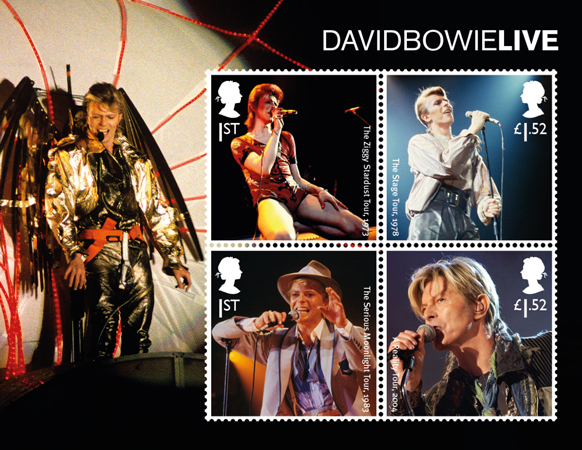 These stamps are sure to be sought after by anyone looking for a really collectable piece of Bowie memorabilia. And there are even due to be limited edition ‘fan sheets’ issued for the those who want to keep something truly special. 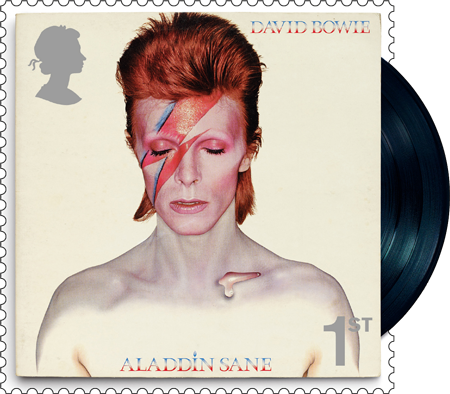 I wasn’t sure Royal Mail could top last year’s Pink Floyd issue, but these stamps are so well executed and poignant in my opinion they will go down as some of the most important musical stamps ever to grace our postage. 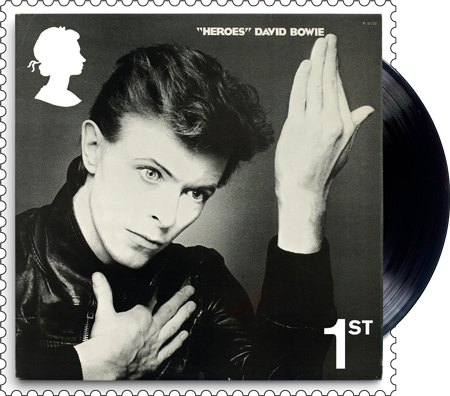 You can reserve all of the new David Bowie stamps right now on a limited edition Collector Card – professionally framed and ready to hang. Click here for details. Did you know that since Royal Mail issued their first Christmas stamp in 1966, over 17 billion Christmas stamps have been printed in Britain? In most years since, Christmas stamps have gone on to become the most popular issue of the year. The 3rd November 2015 saw the 50th Great Britain Christmas issue to be released. In honour of this milestone I would like to take the opportunity to look at some my favourites from these 50 issues. Despite many requests over the years that the Post Office issue Christmas stamps, these had always been refused until Tony Benn became Postmaster General. He had originally wanted them in 1965 and even suggested a charity surcharge. Time was against him which meant 1966 was the soonest possible. Benn, through the Post Office, organised a competition among schoolchildren aged under 15. The competition was launched on Blue Peter, which at the time received viewing figures of around 8 million twice a week. Response to the competition was huge. Over 5,000 designs were submitted which were assessed by a team of eight professional stamp designers. 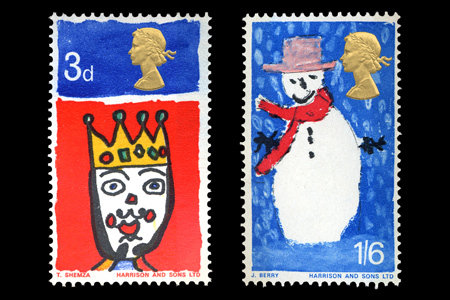 These first British Christmas stamps featured a design by Tasveer Shemza (of King Wencleslas) and James Berry (Snowman). 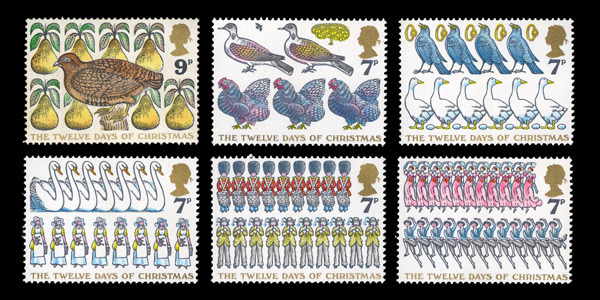 David Gentlemen’s beautifully designed stamps featuring the Twelve days of Christmas. In 1977 the Twelve Days of Christmas were immortalised on the Christmas issue. David Gentleman’s clever design managed to include all 78 gifts mentioned in the song without the stamps looking cluttered and untidy. The designers of the 1981 stamps were all chosen from a nationwide competition launched on Blue Peter. 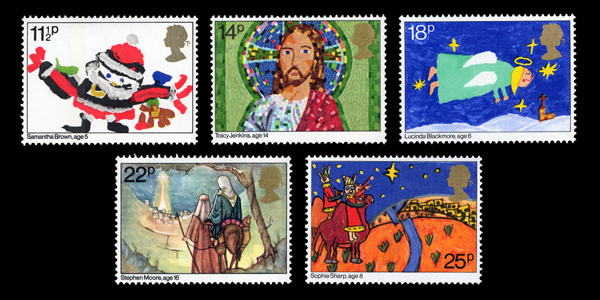 The Christmas issue of 1981 really stands out for me as they were the first Christmas stamps that I remember. Again a nationwide competition was launched on Blue Peter and really caught the attention of children up and down the country. Unfortunately my entry did not make it on to the issued stamps! The five designs that were chosen were from children aged between 5 and 16. 2004’s Christmas issue features Raymond Briggs’ Father Christmas on his busiest night of the year. I think 2004 is my favourite of all the 50 Christmas issues. 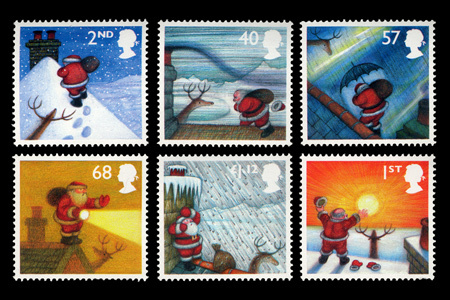 These six stamps feature Raymond Briggs’ beloved Father Christmas as he goes about his duties on his busiest night of the year. Starting with the 2nd class stamp we see him begin to deliver presents in a calm moonlit night, before battling through the elements(40p, 57p, 68p and £1.12) but by sunrise on Christmas Day all is calm again and his work is done (1st class). From 2005 Royal Mail decided to alternate each year between secular and non secular Christmas issues. For the 50th issue the Christmas issue is non secular. 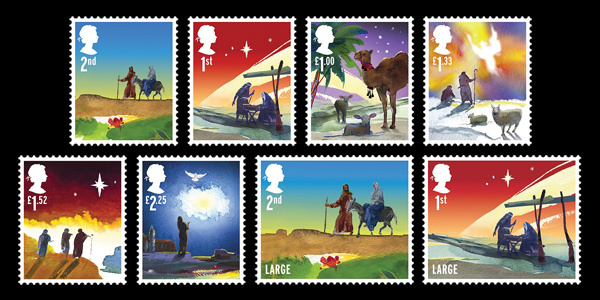 The eight Christmas 2015 stamps feature six traditional scenes from the Nativity story: The Journey to Bethlehem, The Nativity, The Animals of the Nativity, The Shepherds, The Three Wise Men and The Annunciation.